The company, Choc Edge, which was spun out from the University of Exeter in 2012, charges between £50 and £80 to print a chocolate face. Customers can send an image of themselves through the company’s website, and the sculpture is created by building up layers of dark, milk or white chocolate. “Everyone loves chocolate so that’s why we’ve tried to make it easy and accessible for mainstream consumers,” said Dr Liang Hao from the University of Exeter, who founded Choc Edge. Hao’s team of engineers at the University of Exeter was the first to develop a way of applying 3D printing to chocolate, which is a challenging material to work with because it requires accurate control of viscosity and temperature conditions. Three-dimensional chocolate products are created by melting chocolate, tempering it and depositing it onto a substrate in two-dimensional layers as little as 0.05 mm thick. The company claims this is better than traditional methods, because it allows the creation of complex and artistic designs without the need for expensive molding tools. The 3D printer itself, the Choc Creator V1, is also available to buy for £2,888. Hao said that, in the long term, Choc Edge hopes to supply retail units so that everyone can print their own chocolate designs in their local chocolate shop. Commenting on the launch of Choc Edge last year, UK Business Secretary Vince Cable said that chocolate printing is a good example of how backing Britain’s scientists delivers jobs, boosts export receipts and helps to rebalance the economy. “British researchers are once again leading the way turning science into a fun and marketable product with great export potential,” he said. 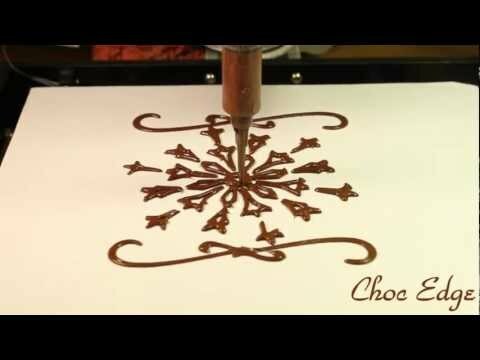 The Choc Edge machine has also been demonstrated on Stephen Fry’s TV programme, The Gadget Man, when he held a dinner party for friends and used the equipment to create personalised chocolate portraits for his guests.